Everyone who has visited a Disney park worldwide has experienced the creativity of Bob Gurr. When reviewing the numerous vehicles and attractions that he has helped bring to life, his two and a half decades as an Imagineer seems too short for the magnitude of his achievements. Bob Gurr’s design career did not end after he left Disney, but continued to grow into new and unexpected areas. With a legendary career and an infectious personality, Bob continues to be a Disney fan favorite. On October 25, 1931, Robert Henry Gurr was born to Henry and Helen Gurr in Los Angeles, California. Young Bob was a creative boy who was an energetic handful for the teachers unable to keep him occupied. In fact, Gurr was expelled from the third grade and sent to the Burbank Military Academy where he enjoyed their project centered curriculum in place of the repetitive grammar school curriculum. Gurr’s enjoyment of unique and varied projects would stay with him for a lifetime. When the Army took over the academy during World War II, he returned to public school, but now in Junior High he could select electives, courses he would excel in while he tended to lag in the required courses. An architecture teacher noticed young Bob’s desire and ability to design automobiles and allowed him to free draw cars when his assignments were completed. That same teacher later encouraged Gurr to attend the Art Center School in Los Angeles and its newly formed Automobile Design department. Gurr entered the Art Center School in 1949, the first year it was authorized to offer four year baccalaureate degrees. In 1954 the school would be renamed the Art Center College of Design. The instruction focused on something Gurr excelled at, real world skills. The curriculum prepared students for jobs and immediate employment. Gurr, like many graduates, found themselves employed quickly. Before graduating, General Motors, who had provided him a scholarship halfway through his program, hired him as an automobile stylist. In May 1952, Gurr left California for Detroit, Michigan with his Bachelor of Arts Degree in Industrial Design and hopes for his future in the automobile industry. Before he even arrived in Detroit, his position was moved to Ford. Dissatisfied with the politics of major auto companies and designing hub caps, he left a year later and returned to California. In California he made ends meet by two means. The first was writing books on car design including How to Draw Cars of Tomorrow, which he published after graduating college, and Automobile Design: The Complete Styling Book. The second paycheck was contracted automobile design jobs for local and Detroit based firms. One day the Placement Officer of the Art Center College would ask Gurr a fateful question, “Do you ever do outside work?” To that point Gurr hadn’t, but today he said yes. The yes would change his career path and introduce him to a new concept, the theme park. After Gurr’s return to California he spent much of his free time with a member of his car club the “Road Burners”, Dave Iwerks. This included frequent dinners at the Iwerks’ home where Dave’s father Ub talked about his day at Walt Disney Productions. Ub Iwerks was already a Disney legend as the original animator of Mickey Mouse and was at the time engrossed in his work at the Special Process Lab. At one of these meals the senior Iwerks mentioned a small car driving around the studio that was only had a chassis. Gurr did not realize that this small comment would be linked to his own future. The outside work that Gurr was referred to in the summer of 1954 was to design the body of that little car under the supervision of Studio Machine Shop Manager Roger Broggie. The car was for an attraction for Walt Disney’s new project, Disneyland, to open in 1955. Gurr was brought to the studio to serve primarily as the stylist for this little car. Walt Disney had decided to design his own car for his driving attraction instead of buying an off the shelf model. Gurr soon found out that he was also expected to draft the car’s parts so they could be massed produced. Suddenly the designer found himself working as a mechanical engineer. Bob spent his evenings drafting for Disney and his days working at an automobile design firm. Every Saturday he drove down to the studio to show his designs and drawings to Broggie and other Disney employees. One Saturday in December 1954, Broggie remarked that he wanted to keep Gurr busy with Disney work. Gurr remarked maybe he should quit his other job. Broggie jumped at the comment, took Gurr to the Personnel Department, and signed Gurr on as a full-time employee immediately. Gurr provided his own first official title, Director of Special Vehicle Development when a title was needed for business cards. Bob was officially a regular employee for WED Enterprises and added to the full-time team targeting Disneyland’s opening. Gurr designed the body for Disney’s new attraction car. His alma mater the Art Center College made the clay model of the design, saving Disney money by using student labor. Additionally, Gurr redesigned the chassis that was to be put under his car design. Disney contracted Glasspar to craft 40 of the Gurr fiberglass bodies for the car and MAMECO Engineering to assemble the vehicles for the Richfield Autopia, sponsored by Richfield Boran Gasoline. As each of the 40 cars were completed they were delivered to Disneyland, without bumpers. Aluminum bumpers were added at the suggestion of Disneyland sponsor Kaiser Aluminum. The cars had a maximum speed of 25 miles per hour, but pre-set governors limited the speed to 11mph. The original cars had two accelerators pedals; one was built for the shorter legs of children. And each car had automatic braking which engaged when the foot was lifted from the gas pedal. There was also a parental hand brake placed under the dash and a long brake handle mounted to the body for ride operators. In testing Gurr discovered that unlike steel bumpers the aluminum models failed to spring back into shape and were becoming warped as ride operators tested the cars. As he prepared for opening day, Gurr’s biggest worry was the damage that guests would do to the bumpers on the 40 Autopia vehicles. Gurr had also made plans for an Autopia bus to give small children rides, but it was never built. On July 17, 1955, Walt Disney presented his new project to the world on ABC television. During the Dateline: Disneyland program, Bob lead 20 of the Autopia cars in the Opening Day Parade. After the parade chaos ruled at the Autopia attraction. The cars were in disastrous shape. The bumpers, as Gurr feared, were distorted from guests bumping. There were a large number of other car problems ranging from brake damage to shot bearings. Cars could pass each other on the two lane road, and accidents did occur including spin outs on the roadway. The guests, after waiting in long lines to drive, were treated to cars without padding on the steering wheels, which lead to Gurr taking several children to First Aid with broken teeth. Additionally the ride operators were beat up between collisions with drivers and bruises from kick starting stalled cars. By the end of the week only two of the 37 cars used on the attraction were still running (one car of the original 40 was a special model for Walt Disney, and two were styled as police cars for ride operators). Gurr pulled his own tools out of the trunk of his car and began to reconstruct the broken vehicles. Soon after Disney provided two mechanics to repair the broken cars while Bob spent the summer redesigning the cars to survive the daily wear and tear of guest usage. By the end of the summer he had turned most of the original cars into improved Mark II or Mark III models. Gurr and the Autopia team soon after designed a new drive package for the cars and converted all Autopia vehicles into Mark IVs. 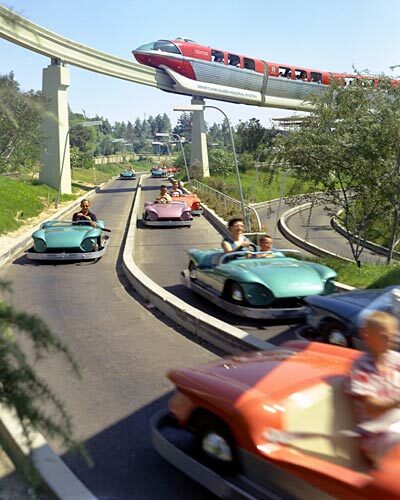 By 1958, park operations decided to redesign the cars yet again creating the Mark V model for use in the Tomorrowland Autopia and in a new Fantasyland version of the ride. This updated version of the cars would run until 1965. While designing the Autopia vehicles, Walt Disney asked Gurr to add another project to his workload. Disney wanted authentic antique vehicles travelling on Main Street U.S.A. to help set the mood for the turn of the century community. While shopping for authentic cars to use in the park Bob realized that they would never handle the day-to-day wear of life in a theme park. So instead of refurbishing antiques, he decided to create vehicles that looked authentic but actually used modern, off the shelf parts. On opening day, three “Gurr-mobiles” were present in the park. Two were travelling from the train depot to the central plaza; one red horseless carriage and a two-story Omnibus ferried guests, while a Carnation truck stayed parked for viewing. Though built with modern parts, Bob made sure that each authentic reproduction antique both ran and sounded period accurate. In 1957 a yellow horseless carriage and a second omnibus were added to the fleet. A year later Gurr remarked to Disney that they did not have a fire engine, which he thought they should have, leading to his commission of creating an antique fire truck. Bob drove the engine down the Santa Ana Freeway himself to deliver it to the park. And the fire engine was such a hit with Walt Disney he often drove it around the park before the gates opened. Gurr’s Main Street vehicles with their one way trips have carried weary guests for generations. The vehicles typically take 7.5 minutes to make a round trip at four miles an hour. They accommodate approximately 150 guests an hour. Gurr did not build any backup vehicles, but luckily in their first 20 years of operation there was only one breakdown. During the early years of Disneyland Gurr completed a number of projects. One was a streamlined narrow train that ran from Tomorrowland to Fantasyland. Gurr added to the Disneyland Railroad by designing the Excursion Train which debuted in 1958. Then he moved out of simply creating vehicles and started designing other show elements. For example he developed the mechanics behind the dancing tribesmen of the Jungle Cruise and the dancing tall flowers of Alice in Wonderland. Despite the magnitude of these projects, arguably Bob’s greatest triumphs were yet to come. With Disneyland open, Gurr continued to create attractions, especially transportation themed, for the park. These new projects would include trains, spaceships and a return to Autopia. Bob would also be asked to contribute to the animation of a beloved President. Walt Disney and many of those that worked for him, including Gurr’s boss Roger Broggie, loved trains. Disney decided he wanted a streamlined train for his park and Bob was tasked with designing this train. Gurr observed the General Motors Aerotrain running between Los Angeles and Las Vegas, and loved the design. In February 1957, Bob drafted the design drawings of a train based on the Aerotrain and had the drawings completed in 20 days. He went to a local junkyard and purchased 1954 Oldsmobiles which he used to design the cowl, windshield and front doors, shortening the bodies since the train would be smaller than a car. A Chevrolet 327 engine and an eight-wheel drive gave the new train greater speed than the typical train, giving it the label of the world’s fastest miniature train. On June 26, 1957, the Viewliner began operation between Fantasyland and Tommowland. Despite electrical problems and a coach fire, Walt Disney served as the first fireman of the streamlined train, with Gurr as engineer on the track between Fantasyland and Tomorrowland. Bob missed the first station on the opening ride. He backed up to the platform and was then berated by Walt Disney for not blowing the whistle three times to alert bystanders that he was backing up. The Viewliner would only run until September 15, 1958, when it was removed for the construction of other Gurr projects. In October 1958, Walt Disney returned from a trip to Europe and requested his designers develop a version of the German Alweg Monorail for Disneyland. The Viewliner served as a foundation for designing the new train. Gurr used the same structure for the new attraction, from the floor up and including the doors, windows and face to face seating, all based on his miniature train. Despite having mechanical precedents to work with in the Alweg Monorail and the Viewliner, Gurr found the new train visually displeasing. He thought it looked like a bread loaf on a rail. Bob reached back to images from Buck Rogers and curved the skirt around the skids to hide the shape and give the train a sleek futuristic look. The original red Monorail train opened on June 14, 1959. The train was on its beam for only two weeks before opening and experienced electrical issues on opening day. Gurr expected the train to catch on fire! For the inaugural ride, Vice President Richard Nixon and family joined Walt Disney with Gurr as Engineer. After the Monorail had left the station Nixon realized he had left his Secret Service detail at the platform. At the insistence of the Nixon children the party took a second trip, with Bob worrying about potential fires and the wrath of the Vice President’s bodyguards. When Nixon left the attraction after the second ride, he was amused to find his detail remained on the Monorail thinking that Nixon was riding again. Also during 1958, Disney asked Gurr to develop another transportation based vehicle, a bobsled shaped roller coaster car. When his design was completed, Broggie asked Gurr to begin laying out the track to fit within Matterhorn Mountain. Bob worked with Ed Morgan and Karl Bacon of Arrow Development who had developed a new bent steel pipe track roller coaster system. Teaching himself trigonometry, Gurr did the calculations by hand. Once he had a track layout that fit within the confines of the mountain’s structure, Arrow built the fan favorite Matterhorn Bobsleds which opened along with the Monorail on June 14, 1959. The highly successful ride proved Gurr could design beyond wheeled mass transportation. With trains, cars and sleds under his belt, Gurr moved to flying saucers! An inventor brought a bumper car style ride vehicle to WED hoping to sell it to Disney. Bob was one of the first to try out the gas powered hover craft. It was loud and blew dust everywhere, a safety hazard in Gurr’s opinion. But the idea did not go away and Morgan and Bacon developed a concept of using a unpowered vehicle on a platform of pressurized air. Bob designed a flying saucer attraction car for their new concept. The Flying Saucers opened to guests on August 6, 1961, but technical problems led it to run for one day short of five years. In 2012 the concept would be revisited with Luigi’s Flying Tires at Disney California Adventure. Gurr like others at WED saw much of his efforts redirected to new projects when Walt Disney decided to participate in the 1964 New York World’s Fair, somewhat as an experiment to determine if a Disneyland like theme park could find an audience in the Eastern United States. Bob returned to his Detroit automobile roots with the Ford Magic Skyway, in which he modified Ford, Mercury and Lincoln convertibles into ride vehicles. But the fair also provided Gurr with something new, people! The Disney team had added a late project sponsored by the state of Illinois, Great Moments with Mr. Lincoln. The star of the show was to be full sized animated figure or Audio-Animatronic of Abraham Lincoln. The mechanics of the figure were currently too heavy and it was too limited in movement. In less than 90 days, Gurr dissected the Lincoln frame, analyzed the desired motions and rebuilt the mechanics with lightweight materials. The years after the World’s Fair were focused on transportation for Gurr. He worked to improve the Disneyland monorail. 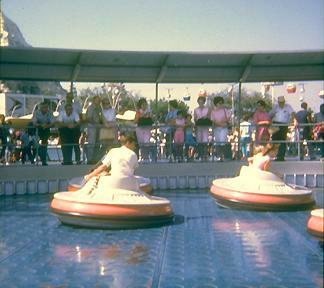 The Mark II train included a “double bubble” top based on a request from Walt Disney. He thought the driver’s view from the monorail was so breathtaking that guests should be able to share it. The Mark III was lighter and had a lower center of gravity. Additionally, the Mark III provided an updated and more reliable electric propulsion system. Introduced in 1968, the Mark III would run at Disneyland and in Las Vegas until 2006. At the same time Gurr was also assigned a project given the temporary name of PeopleMover, a name that it never seemed to lose. This slow moving transport provided Bob the challenge of loading guests on a continually moving ride vehicle. He solved the problem by loading from a moving turntable, rotating slightly slower than the PeopleMover itself. He also designed the cars used on the PeopleMover, officially known as the WEDway. The WEDway vehicles included automatic doors and roofs for guest convenience. The WEDway opening in 1967 would slowly transport guests through Disneyland’s Tomorrowland until 1995, with a Walt Disney World Magic Kingdom version operating to this day. Gurr’s experience with slow, continuously moving ride vehicles was key in the development of the Omnimover, initially used for Monsanto’s Adventure Thru Inner Space at Disneyland. The conveyer belt system of ride vehicles allowed Imagineers to turn the guests in any direction. The Omnimover system has been recycled by Imagineers since its 1967 introduction and includes The Haunted Mansion, Spaceship Earth, and The Little Mermaid: Ariel’s Undersea Adventure. And finally, Gurr returned yet again to Autopia, with the Mark VII car. The Mark VI vehicles all suffered cracking due to constant bumping. So Gurr determined that bumping had to be taken into account to design a longer lasting vehicle. The chassis of the Mark VII was built to flex to take into account daily torture. Gurr’s Mark VII’s would run until 2000, when new cars replaced them. The new and improved vehicles would have better engines and electrical systems, on top of a Mark VII chassis! With the building of a new East Coast resort, the legendary Imagineer was called upon to use his special design and production skill sets. One of his first tasks was to build the Monorail Mark IV for the Florida resort. The new model would be required to carry more guests over a greater distance than its California cousin. Additionally, Gurr had to plan for more extreme weather in Florida, requiring encased components and electrical equipment that could tolerate daily rain. The Mark IV would run in Florida from the opening of the resort until 1989 when two of the trains became the Las Vegas Monorail, operating until 2004. Additionally, Bob oversaw the assembly of the 20,000 Leagues Under the Sea submarines at the Tampa Shipyard. Gurr taught himself electrical design as the drawings of the electrical systems he received from California were inaccurate. And finally, unable to find a third party product suitable for Disney’s needs, Gurr designed the Walt Disney World Tram tractor to transport guests from the parking lots to the ticket center. An updated version of that tractor is used at Disneyland to this day. From 1979 until 1981, Gurr was assigned to assist in the development of Tokyo Disneyland. Bob traveled to Japan and inspected manufacturing and production facilities. At the office in Glendale he gathered designs from the team working in Japan and forwarded them oversees. He enjoyed his time aiding young designers in Japan but found he had lost his enthusiasm for Disney corporate life. After returning from Japan, he spoke up in a staff meeting about his displeasure. A month later he was asked to leave, and he resigned of his own will. When asked in a November 1997 interview with the E Ticket, he noted that he had risen to Senior Staff Engineer. That role had him reviewing the work of others, including those leading the design efforts in Japan, but did not provide him the opportunity to design himself. He missed that and wished to return to the drafting table. Regardless of Bob’s reasons, over 25 years of Disney employment had come to an end. In 1981 the time had come for Gurr to leave Disney. He became his own boss as the head of GurrDesign. Bob did not go quietly into the night, but instead continued to find new and exciting projects, 117 to be exact until 2000. Some of these projects were for Disney competitors, including Universal. He designed a mechanical serpent for the Universal Swords and Sorcery Show and a 30 foot animated figure of King Kong for Universal Studios Tour in Hollywood. Gurr also took a number of entertainment projects including the 1984 Michael Jackson Victory Tour lighting systems, a spaceship for the closing ceremonies of the 1984 Summer Olympics, and the Las Vegas Treasure Island Pirate Battle Show. For a man who spent the first half of his career juggling many widely varied projects, these new challenges were business as usual. Today guests in Disney Parks around the globe enjoy the legacy of Bob Gurr. Be it a ride on the Disneyland fire truck, a tour on the Monorail, the bumpy circuit of Autopia, a visit to a haunted graveyard, flying tires and so much more, Gurr’s original, updated and adapted designs are unavoidable. However, there are still intentional tributes to this legend in Disneyland and Walt Disney World. In the Disneyland Park above Disney Clothiers one can find a window for the “Meteor Cycle Co” lead by the “Fast, Faultless, Fadless” Bob Gurr. The window claims that “Our vehicles pass the test of time.” The longevity of Gurr’s vehicles continues to be proven daily. The window’s cycle shop theme is based on Gurr’s love of mountain biking, and includes a bike hanging from the building. In Walt Disney World’s Magic Kingdom Park, Gurr also shares a window with Dave Gengenbach, George McGinnis and Bill Watkins. They share in “The Big Wheel Co.” makers of “One-of-A-Kind Unicycles- Horseless Carriages.” Additionally, Gurr has continually shared his stories on blogs and podcasts, highlighting his fun-loving personality and furthering his legendary status with fans. In 2012 he published those stories in his autobiography, Design: Just for Fun. 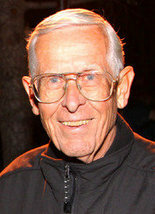 It is nearly impossible to capture the fullness of Bob Gurr’s career. He has provided over 100 designs for Disney Parks, building his legendary status even before Disneyland opened. Over the years Bob proved that there was no challenge he would not take up, even helping to build a human figure, despite being a trained as an automobile designer. With his fingerprints deeply embedded into every Disney theme park globally, it is impossible to imagine a Disney vacation without Bob Gurr’s creations. I have been to Disney Orlando 10 times since 1989 and therefore seen a lot of changes. But the funny thing is out of all the rides and attractions it is still the PeopleMover (WEDway) that puts a smile on my face. I took my neice and nephews recently and again the attraction they wanted to go on again and again was the PeopleMover so thank you Gurr.